I have painted the community of Brigus many times and it continues to intrigue me. It is a short drive from St. John’s, has a rich and colorful history, and an unusual geology. It has high headlands on each side of the harbour that gives magnificent aerial views onto the town. It was briefly the home of Rockwell Kent during his infamous stay in Newfoundland in 1914, and the lifelong home of captain Bob Bartlett the arctic explorer. Patsy Bryant’s hill separates Brigus from Cupids, and the easiest access to the hill is from Cupids as the slope up the hill from Brigus is cliff-like. But once perched on the edge of the hill overlooking Brigus, the view down on the community is precipitous. 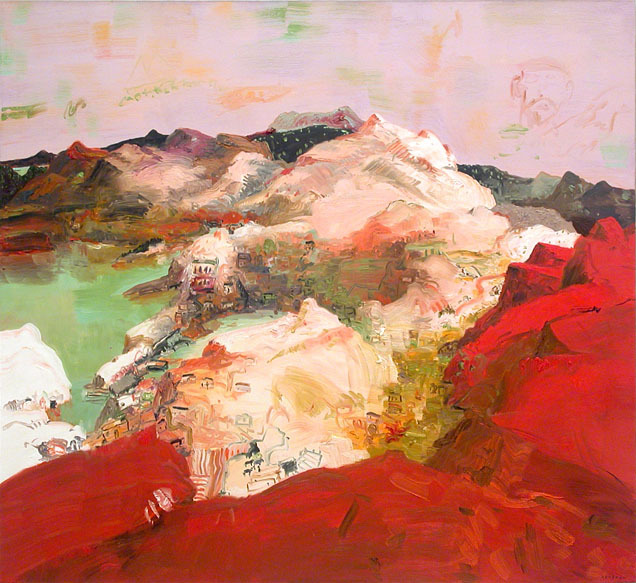 In this painting, Patsy Bryant’s hill is red. I have painted Brigus covered in snow, the water in the harbour a milky green. The view at the horizon continues all the way to the eastern shore of Conception Bay.